Bitsu-bitsu or cascaron is made from mochiko flour, a kind of sweet rice flour and.. Ingredients: 300ml can Evaporated Milk 3/4 cup sugar 2 cups seeded atis pulp 1 egg.. Ingredients: 1 envelope unfavored gelatin 1 qt. fresh strawberries, hulled 1/3 cup strawberry preserves, cut.. 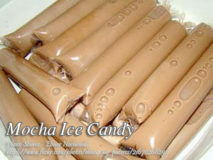 This procedure is on how to make mocha ice candy. On recipe, all you need..